Primary production is photosynthesis: how plants make energy using sunlight. In the Bering Sea, that means phytoplankton (tiny marine plants). The sea ice varies from year to year; some years it reaches farther or melts later; other years it might cover a smaller area or melt sooner. The primary production team hypothesizes that these changes affect the pattern of algae blooms in the spring. 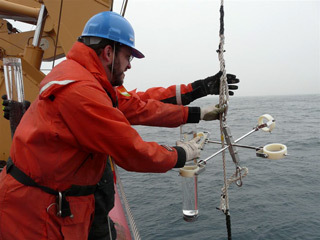 Like many of the scientists on board, the primary production team uses the CTD instrument. They will also take measurements on the ice and incubate samples on deck. 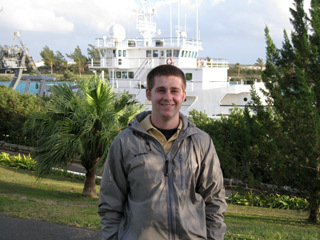 I am a technician from Bermuda Institute of Ocean Science working with Dr. Mike Lomas for micro/picoplankton and pigment collection and to assist in Primary Productivity measurements. It is a challenging and interesting career that doesn't involve a cubicle! I grew up outside of Detroit, MI. I probably spent about a two semesters taking courses that were irrelevant (and quite boring) to my career, yet necessary course requirements. However, the greatest part was actually choosing and engaging in studies (AQUATIC ECOLOGY!) that were truly interesting to me. My role in this study is to quantify the sinking flux of particulate material from the water column of the Bering Sea to the sediments or deep waters. This information is important because the sinking particles represent a food source for animals that live on the seafloor. We would like to know how this particle flux varies with changes in sea ice conditions. To measure the particle flux, we will deploy drifting sediment traps and also make measurements of particle flux indicators in the water column. I chose science as a career because I wanted to participate in furthering our understanding of how the earth works. I was also very good at science in school, and really started to enjoy it when I realized science was a process, not simply the memorization of facts. I chose oceanography for many reasons, the prominent one being that when I was first introduced formally to the subject in college, everything seemed so logical and understandable, more so than any other discipline. Of course, I've always had a deep appreciation for the ocean, and what better way to express that than to study it? I grew up in a small town outside of Albany, NY called Ravena. I was landlocked for 50 weeks a year. The other two weeks were summer vacations spent camping, swimming, and beachcombing in Truro, Massachusetts on Cape Cod. I enjoyed math and science, particularly because answers were not subjective, like in an English class. I really liked that my college classes incorporated field work in the lab experiments, and that the groups were small.